What can I say? Like so many of Lidwien van de Ven’s photographic images, the case of her latest exhibition at Bloomberg SPACE in London is vague. The haze and mist, which constitute the most striking feature of Untitled (Mount Merapi) (2011) – the largest and most prominent work on display – seem to envelop the entire process by which this Dutch mistress of invisibility came to exhibit in the Bloomberg COMMA series. The matter deserves some attention as it clarifies the uneasy co-existence of art, freedom and the information corporation. In 1981 Bloomberg started out with one core belief: that bringing transparency to capital markets through access to information could increase capital flows, produce economic growth and jobs, and significantly reduce the cost of doing business. Today’s Bloomberg builds on that foundation – everything we do connects decision makers in business, finance and government to a broad and dynamic network of information, news, people and ideas that enables faster, more effective decisions. Come see how we do it. Impressive! A virtual volcano of creativity could be expected in response to this principled pledge, this generously offered space for experiment. These mission statements are not unusual for corporations or art spaces, but it may be worthwhile to ponder how accustomed we are to reading them without thinking of their potential for being contradicted in practice. In this light, van de Ven’s exhibition strikes one as exceedingly restrained. There are four components to it: the aforementioned monumental photograph, Untitled (Mount Merapi), in which haze and mist obscure the very volcano that determines the wide framing; a pensive video on a monitor showing women going about daily chores at the Istiqlal Mosque in Jakarta (notably the largest mosque in Southern Asia); a black square; and a white square. That is it – or so it appears. Lidwien van de Ven, installation view, COMMA 32, Bloomberg SPACE, 2011. Photograph: Peter Abrahams Of the two squares we read (in the exhibition essay by curator Sacha Craddock) that the black square denotes ‘a break, full stop, end and relief’ and that the white one denotes ‘an absent image’.2 But is this any absent image, or a specific image absented for a specific reason? Having sustained a conversation with the artist over the course of the last few weeks, I know that van de Ven had every intention of including an image instead of the white square, namely Berlin, 02/10/2010 (die Freiheit) (2011). What has become of Lidwien van de Ven’s ‘Freedom’? The photograph itself shows a gathering in support of a ‘freedom party’ in Berlin, and could as such be seen to expose the hijacking of a dearly held ideal by Europe’s networked nationalists. 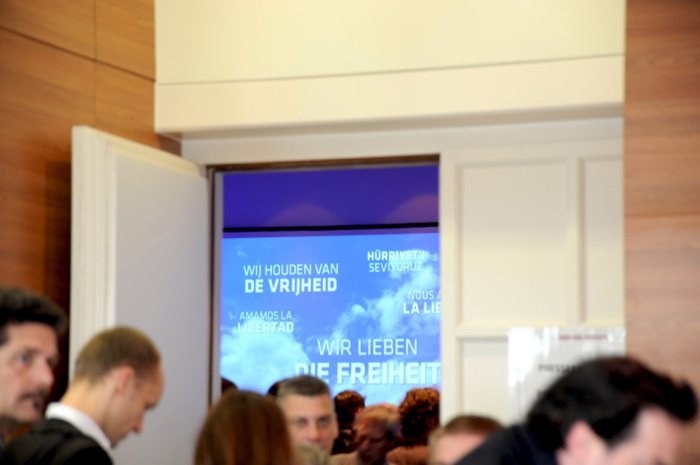 In the background, through a door to some sort of convention room, the words ‘we love freedom’ repeated in Dutch and in German appear against a projected image of fluffy clouds. In the foreground, blurred figures of suited men, who have spilled outside the convention room door, mill about. Rendered in this hazy way, the image casts an askance view on the deployment of freedom in the corridors of power. Like all journalistic photographs, van de Ven’s image requires some background, as the freedom being invoked here is highly specific. In the Netherlands, the politician Geert Wilders has emerged as the face of a particular power that relies on the rhetoric of freedom exercised as freely wielded hate. As leader of the Dutch Party of Freedom (Partij voor de Vrijheid, or PVV) Wilders baits the elderly and others who have fallen prey to the precarious economy by constructing scapegoats (mainly Muslim immigrants but also the broad cultural sphere – he famously quipped that art is a Left-wing hobby). Remarkably, the blurring of free speech with hate speech in Wilders’s vocal anti-immigrant, anti-Muslim rants has not prevented his ascendance in the polls – quite the contrary. It is becoming increasingly difficult to keep him out of the Netherlands’s ruling coalition. In freedom, Wilders seems to have found his bulletproof armour; a development which illustrates just how ripe for abuse freedom is and how, in politics, it continually comes to stand for its opposite. Wilders is currently busy expanding his ‘international freedom alliance’ to countries in Europe and North America. His rising popularity has made him the go-to man for certain power-starved constituencies in Germany and beyond. Van de Ven’s Die Freiheit image documents precisely this process in Berlin: it shows a gathering organised by the German politician René Stadtkewitz – where Wilders was invited as guest of honour – which took place in the process of founding a variant of the PVV in Germany.3 Stadkewitz, a former member of the ruling Christian Democrats (CDU), was thrown out of his party for his support of Wilders. Stadkewitz may have felt liberated in his project by the rising prominence of Thilo Sarrazin, another German ex-parliamentarian whose career has taken a turn towards Wilders’s rhetorical terrain. Sarrazin’s most notorious display of free and frank speech is the book Deutschland schafft sich ab (Germany Abolishes Itself, 2010), a deeply racist thesis that essentially blames Muslim immigrants for the falling standards of the German education system (among other ills). The fact that, unlike Wilders, Sarrazin was formerly a Social Democrat and a member of the Executive Board of the Deutsche Bundesbank complicates the ‘right-wing extremist’ label attributed to such hate-mongering nationalist forces. The supporters of Europe's networked freedom parties are blurry men (and women) indeed. The question to be asked, in this particular case, is to what extent the Bloomberg SPACE and its parent company are implicated in the complex reversal of democratic values exemplified by these Vrijheid/Freiheit politicians – in this case, freedom, transparency and creative experimentation. In a space that makes strong claims to transparency and the support of artistic experiment, why was it impossible for an artist to exhibit a work that – for all its blurriness – allows us to think more clearly about the contradictory conditions of freedom? Was it that the corporate setting of the ‘freedom’ image looked too much like the Bloomberg SPACE? Of course, it is not entirely clear whether the image in question was wilfully kept out of the exhibition or whether that modern Leviathan called bureaucracy intervened with its passive power.4 What is clearer is that, in contradiction to its claims to transparency, the statement used by Bloomberg to introduce its COMMA programme obscures the practical reality of the process by which an artist comes to agree upon what he or she is allowed to exhibit. Van de Ven was told in autumn 2009 that a body of work she aimed to show at Bloomberg SPACE could not be exhibited as it contained images that were ‘too sensitive’: one showed a flag photographed in Bangalore depicting ‘The Leaders and Heroes of Islam’; another depicted two Palestinian boys and two Israeli soldiers with armoured vehicles casually coexisting on a dusty road in the Occupied Territories; a third showed a building wall in Ramallah with a picture of a faceless martyr.5 These are images that, without showing it, can call up bloody conflict, so the charge of sensitivity is not unfounded. But they are also rather banal and peaceful in relation to what we find in the news, exposing the daily reality that escapes the presentation of ‘decisive events’. The more pointed question to be asked here is whether a charge of sensitivity makes any sense in a space of art – is not art there to make us more sensitive? Moreover, as the artist is well known for her documentation of politically prickly sites that highlight the invisibility in the West of alternative world views, her invitation to experiment at COMMA could not have been ignorant of the probability that this would result in the very images which were eventually censored. Van de Ven’s images – which have tended to be opaque in the extreme and to require some explanation if one is to bring to light the elements of invisibility that so interest the artist – are highly suggestive in certain combinations. The image of a picturesquely diffuse and grand landscape and the image of (not angry young men but) peaceful women folding cloth in a mosque, all of which formally point to the greatest achievements of the Dutch Golden Age, are much more palatable without an image that renders freedom in the West strange. The photograph and the video showing Indonesia lose much of their bearing on the European reality when juxtaposed with a black square and a white square, instead of an image of Berlin. With the removal of the image, the under-examined grey zone connecting the world’s largest Muslim country (and the birthplace of Wilders’s mother) and Europe has been temporarily effaced. Were the freedom image present instead of the white square, a more politically charged chain of associations may have come to the fore. And the associations to the European tradition in painting would not have been broken as the freedom image has a striking structural resemblance to a painting by René Magritte, which hangs in Rotterdam’s Museum Boijmans van Beuningen, titled Au Seuil de la Liberté (On the Threshold of Freedom). Painted in 1930, it shows a cannon pointing through a door towards a puffy-clouded sky. What is more, Magritte was Belgian, and on 18 March 2011, the state of Belgium set a world record in the number of days it has persisted without a government. For the sensitive viewer, van de Ven’s allusion to Magritte is like a cannon pointing to the dark cloud of democratic crisis hanging over Europe, and a suggestion that a deeper understanding is needed of the subtle dismantling of democratic ideals under way. What more can I say? I should add that the first sentence of this text quotes the title of a recent BBC series that purports to examine the dire state of the freedom of speech in Southeast Asia. The problem of censorship is often exported to far off continents – think of the times you’ve heard about censorship in China lately. More closely examined, the case of Lidwien van de Ven’s exhibition at Bloomberg SPACE might wake us from the coma of delusional belief that censorship is everywhere but here. But how to combat this clouded situation? In Jean-Luc Godard’s La Chinoise, a masterful cinematic ode to ideological confusion of the late 1960s (which saw many students and intellectuals turning to Maoism), the following maxim appears on a wall: Il faux confronter les idées vagues avec les images claires. I am attracted to this call to clarity in the current climate of political disorientation. Given the deflections, the mist and blurring that occur in van de Ven's images, one might conclude that the opposite dynamic is at work in them – that she confronts the dubious clarity of powerful ideals articulated in the hyper-mediated culture (freedom being chief amongst them, the threat of Islam is another) with oddly vague images. Her choice to show at the Bloomberg SPACE despite the lack of freedom that the situation presents shows something as crucial as clarity – a desire to stay in the game. And for now perhaps this strangely restrained show is the clearest image we can get of the dubious situation.